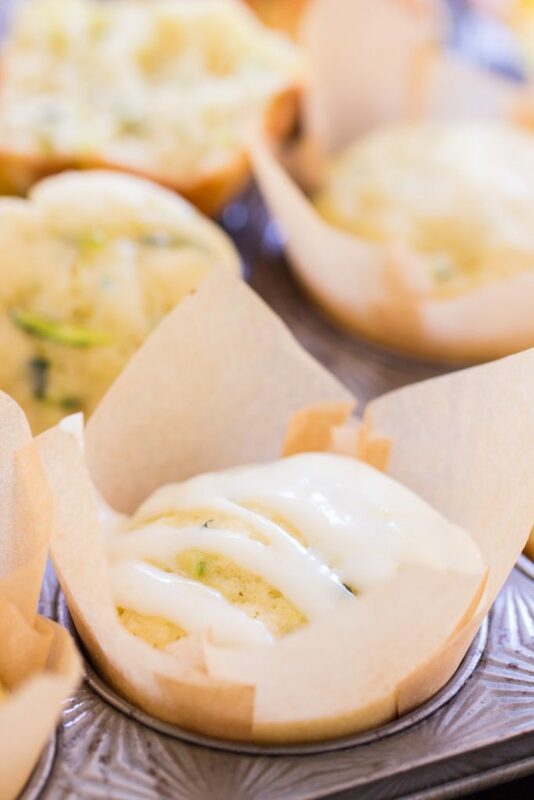 Moist, sweet, and fluffy Lemon Zucchini Muffins with Lemon Glaze, almost like cupcakes! 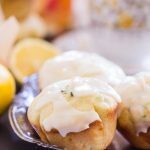 These Lemon Zucchini Muffins with Lemon Glaze are super soft and light, and bursting with zesty lemon, a unique spin on classic zucchini baked goods! 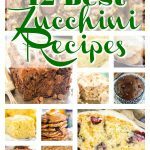 I really slacked on zucchini recipes the last few years, but I stepped up my game this summer, and I came up with some of the best recipes out there that you can hide vegetables in. 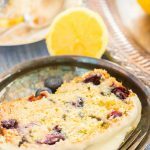 I have 4 total recipes, and I love, love, LOVE them all. It’s been fun to bake with veggies and not know they are there. 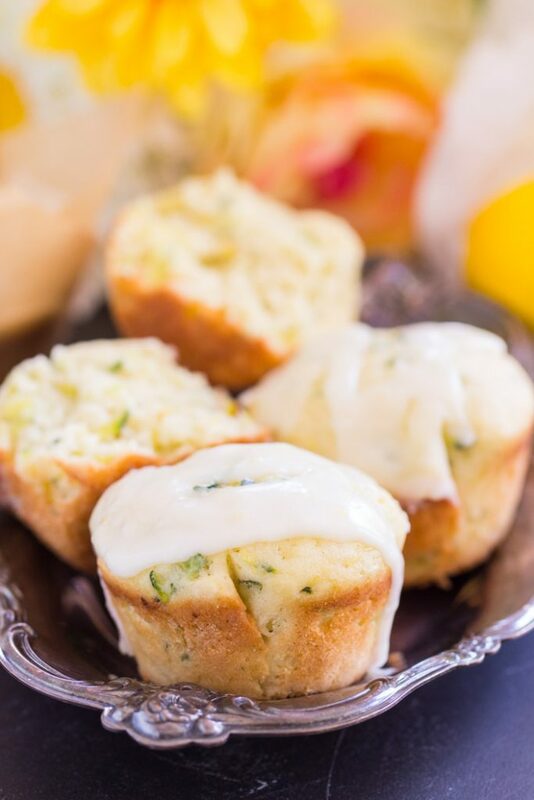 Today I’m sharing these Lemon Zucchini Muffins with Lemon Glaze. I’m head-over-heels for them. They have the texture of cupcakes, honestly, but they’re not as sweet, so they’re muffins. They’re such a soft and fluffy muffin though. Not dense or bread-like, but really soft. They’re insanely moist, of course, because zucchini will do that for baked goods, and zucchini also adds the most awesome, subtle sweetness. It’s funny how a vegetable helps with sweetness in a recipe, but doesn’t add vegetable flavor – thank goodness. Because unless it’s pumpkin, I don’t want my baked goods to taste like veggies. Though I guess pumpkin is technically a fruit, but…. c’mon. 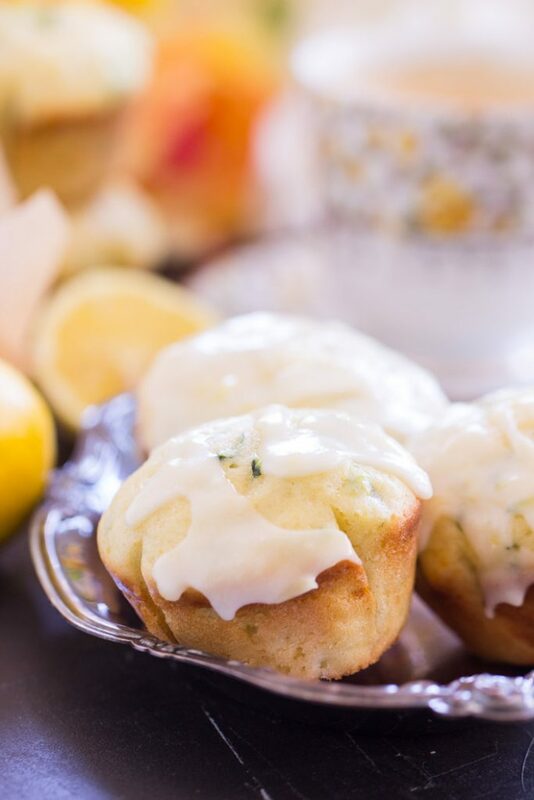 These Lemon Zucchini Muffins get their lemon tang from fresh lemon zest, and a little lemon extract (if you have it, but not required), and then the lemon glaze on top is made with fresh lemon zest and juice too, so it’s verrrrrry fresh and tangy! I love my lemon to be bold and in-your-face. What about you?? I like it to be super vibrant and strong. 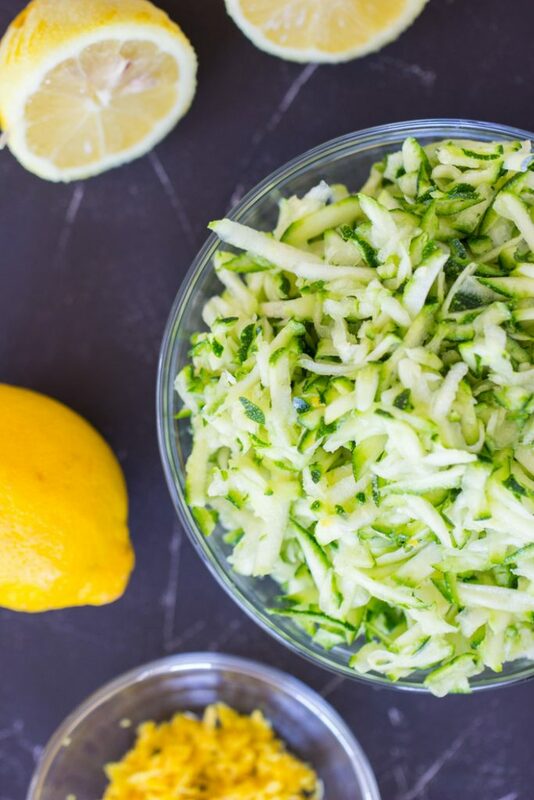 Anyhoo, lemon meshes really nicely with zucchini. Who knew? 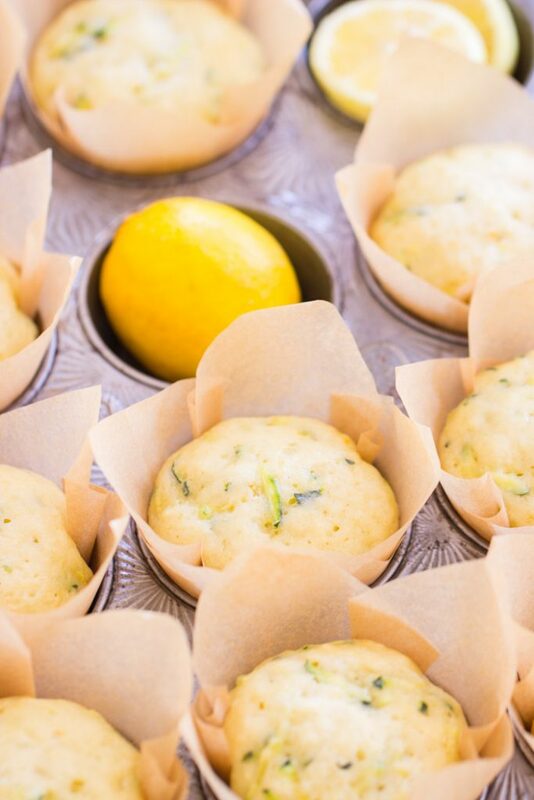 I’m obsessed with these Lemon Zucchini Muffins, and I made several batches while testing. I was so happy to have a ton of these, and I packaged them into small baggies to throw in the freezer. I’ve been defrosting them in threes for a few months now, and I also have a container of leftover lemon glaze too. It’s been an amazing run. I try not to play favorites here on the blog, so don’t ask me which zucchini recipe I love most. What I love about each of the ones I’m sharing this summer is that they’re all really unique and different from each other. Even though they’re all heavy on zucchini, and that’s their main theme, they’re all so different. 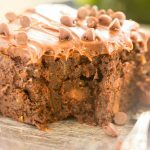 If you missed my previous zucchini recipes, I posted this Chocolate Zucchini Coffee Cake. It’s like 4 inches tall, and it has a ribbon of chocolate streusel through the middle, as well as on top. It’s unbelievable. Also, these Blueberry Zucchini Bread Pancakes – the most gorgeous and tasty stack of pancakes you’ll ever experience. I have one more new zucchini recipe to come this summer still. Yay! 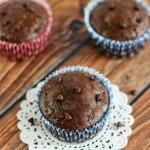 Then I also have these Chocolate Zucchini Muffins with Chocolate Chips, which are a few years old now, but a recipe that I come back to again and again. They’re lightened up on oil and sugar, and I subbed some Greek yogurt in, so they’re on the healthier side, but they don’t sacrifice flavor or texture at all. Those are adapted from an old family recipe that we’ve used for years. 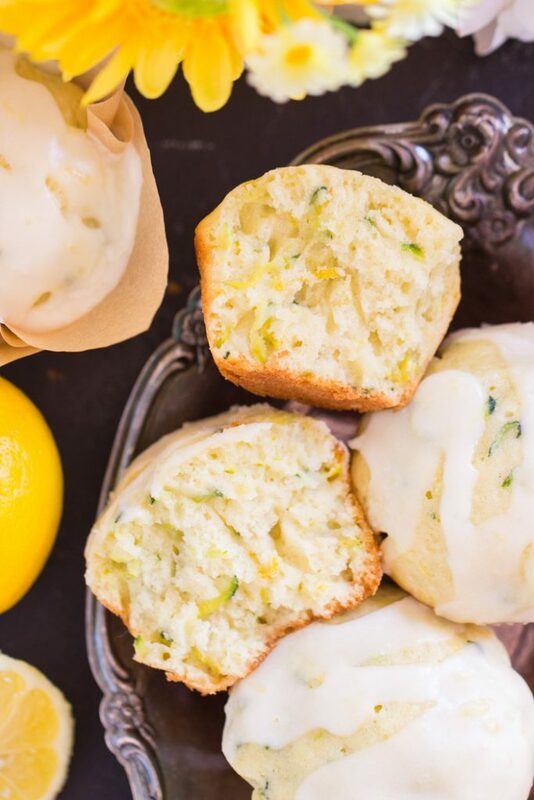 If you’ve got zucchini to use up this summer, and let’s face it, we all will, then add these Lemon Zucchini Muffins with Lemon Glaze to your recipe list. If you try them, let me know what you think! 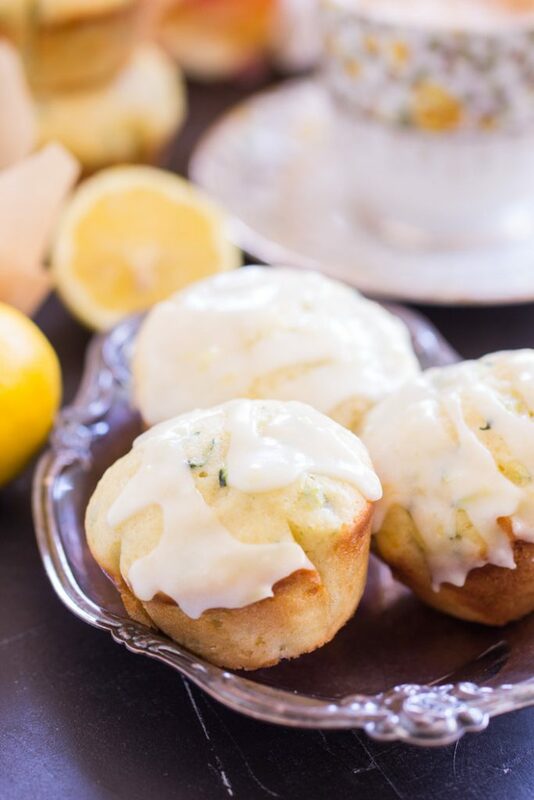 Moist, sweet, and fluffy Lemon Zucchini Muffins with Lemon Glaze, almost like cupcakes! 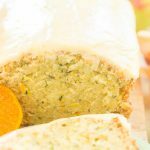 These are super soft and light, and bursting with zesty lemon, a unique spin on classic zucchini baked goods! In a large bowl, whisk together eggs, Greek yogurt, oil, vanilla, lemon extract, grated zucchini, sugar, and lemon zest. In a medium bowl, combine flour, salt, and baking soda. Add the dry ingredients to the wet ingredients, and mix until just combined. Don't overmix - a few lumps are okay. Place paper liners in each of 18 regular-sized muffin cups. Divide batter among muffin cups, filling them about 3/4 full. Bake at 350 degrees for 22-25 minutes, or until edges are golden brown, and a toothpick inserted near the center comes out clean. The tops will also appear 'set'. In a medium bowl, whisk together powdered sugar, butter, lemon juice, and lemon zest, until smooth.